Confession: I hate the green stuff. Always have, since I was a little kid. Maybe it has something to do with my (otherwise sainted) babysitter, who used to boil Birdseye frozen veggies mercilessly on the stove for what seemed like hours, then feed us kids the resultant unidentifiable mush. Later, when I was introduced to salad, I was scandalized. “People eat this stuff? But… but… they’re chewing leaves!” To me, it tasted like I imagined cow’s cud must, based on the (admittedly few) times I’d been close enough to see a bovine masticating. In other words, vegetable matter was nothing I’d want to be cramming in my cakehole if there was any sort of alternative (like, for instance, cake) in the offing. Even into adulthood, the list of the veggies I liked was short: asparagus, zucchini, carrots (sometimes mushrooms, and onions only when caramelized), while the list of the ones I couldn’t stomach was long: everything else. And worse yet, I only enjoyed my winners when they were prepared in a restaurant, artfully arranged and drenched in butter by someone whose years in culinary school had taught them how to disguise the true nature of what I was eating. I’d rarely be bothered to buy vegetables and keep them in my own fridge; the few times I did they just went bad in the bin. So. Fast forward to me at 35. I’m a slug who finds herself increasingly craving carbs, baking breads, brownies, and Bundt cakes by the boatload. I’ve gone from a size four to fat and am gaining weight daily. My self-esteem is in the toilet. I can’t get myself to exercise, lay off the cheese, chips, or Chinese food. I’ve got about the energy of a three-toed sloth (my additional 7 toes don’t seem to improve matters appreciably). I’m beached on the couch watching All My Children (yes, I DVR it, and no, I don’t know why), devouring a bowl of buttery popcorn and trying not to despair when one night my husband brings home a diet guru’s book. (Hubby’s not fat, but he’s always looking to whittle himself down to more of an Italian Stallion than he already is.) Now, I’m a cynic, a skeptic, and a pooh-pooher par excellence, but I decide to read along. The guru suggests that I not try to deny myself anything, but simply add healthy stuff on top of my gluttonous glop. “Like, duh,” I think. “If I eat all that roughage there won’t be room for rugelach.” I’m still not biting (as it were). But I read on, and learn that the guru also says to visualize liking the vibrant, green, growing things. Why this vow? Why this slogan? Well, it starts with the principles of 12-Step recovery. Newcomers are suggested to “make 90 meetings in 90 days,” meaning they are to attend a 12-Step meeting every day for 90 days, without fail or as close to without fail as they can manage. The idea is to get through the tough beginning phase of recovery with a firm commitment, to deal with the acute withdrawal from one’s drug of choice with a blitz of support to fill the void and indoctrinate the mind with another way of living. And I, a junk food junkie, definitely needed a program of recovery. 1. I’d prepare, purchase or order a salad every day for 3 months (and eat it). 2. If I for some reason ate two salads on a given day (unimaginable to me at first) I did not have license to skip the next day’s. It just meant good salad karma. 3. If, on the other hand, I missed a day (and I’d really make an effort not to), I’d have to double up the next. 4. A salad would be defined as something primarily, though not necessarily exclusively, composed of leaves and veggies. A fruit salad would be a pretty bogus substitute (since I already loved fruit), and one I should feel very, very wussy about if I chose to count it. 7. Dressing could be as much or as little as I liked (again not a problem because I mostly like only a little). 8. In order to “count,” the day’s salad should be bigger than an appetizer size if at all possible, and gigantic when feasible. 9. Organic greens are vastly preferable but not obligatory – any roughage will do in a pinch. 10. It’s ok to eat the same kind of salad day after day if I want to – whatever works! 11. Nuts and cheese are also ok, in moderation – gotta make it palatable somehow. First, let me get this out of the way. No, I did not lose a lot of weight. You might, if you try this, but I didn’t. I don’t know why, but I have a few good guesses. (Lack of exercise ranks right up there.) And yet, that was surprisingly ok with me. As I went along, my goals evolved, and I discovered that what I really wanted most was simply not to be limited in my tastes and desires. I wanted to crave healthy foods as well as fatty, sugary crap, and to discover what it felt like to live on the flipside of carnivorousness. Another early discovery: I liked being on a mission. I relished having a commitment not only because I knew that, without it, I would not have continued to eat healthier past the first week. Part of me was actually really proud of what I was doing, even if others found my kick incomprehensible. I found that bragging (or kvetching) about the commitment publicly really helped. 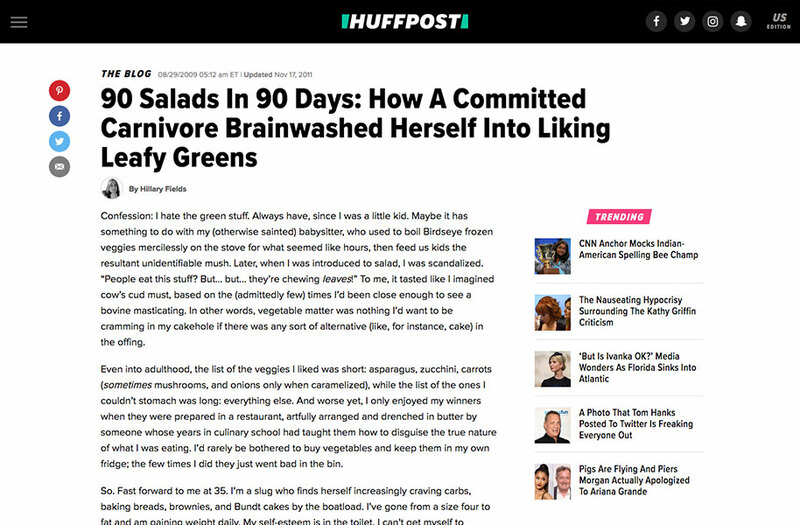 Early on, I started telling anyone and everyone about my “90 Salads In 90 Days” blitz, and people started getting on board. Soon, I was posting my Facebook statuses as “Day 11, Cobb Salad with homemade turkey!” and uploading photos of my creations. I even got some salad groupies and a few copycats inspired by my “movement.” Friends started sending me recipes for their favorite salads, and when I faltered, finding no inspiration to cram another cold, wet, squeaky batch of vegetation into my quavering yap, they posted encouragement, followed up diligently, harangued me to keep going. I didn’t want to let my salad cheerleaders down. Ah, well. For me, it wasn’t about the actual recipes I tried so much as it was about the knowledge that I conquered a major stumbling block that was endangering my health and cramping my style. By the end, I really did (and do) like salad. I’m still a little limited in what I’ll eat in it (no red onions, no peppers, no cilantro, etc), but I truly like the experience of it on my tongue. And more than that, I have the knowledge, I actually altered my own brain for the better. Through perseverance, I gave myself the gift of better health. “So what happens on Day 91?” my friends have been asking. “Do you eat a cheeseburger?” (Not like I ever stopped eating burgers during the blitz, I just made sure to order a salad before or in addition to them.) I’ve given the question a bit of thought, but the answer is really pretty simple. What happens to an alcoholic after he’s made his 90 days? Does he go on a bender? Not if he wants to stay sober. No, on Day 91… he goes to another meeting. And I eat another salad. Maybe not that day, maybe not the next, but soon, and for the rest of my life. As for future crackpot commitments? Well, my husband suggested “90 Lays In 90 Days” but I said it’d already been done. Meantime, look for me on the Beliefnet blog, Everyday Ethics.